Fun races followed by a Pie and Pea Supper. 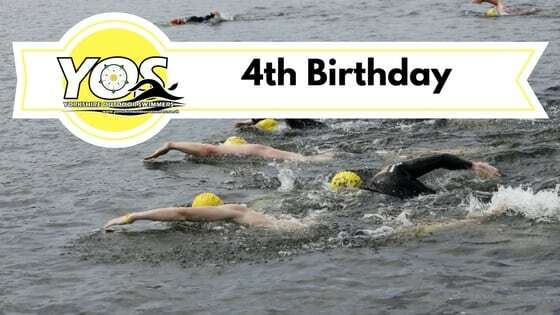 Join us to celebrate 4 years of Yorkshire Outdoor Swimmers. There will be a swim session from 2 pm till 3 pm, then fun races from 3 pm till 4 pm followed by a Pie and Peas supper. You only need to book and pay here if you want Pie and Peas as we need to make sure the cost of the food is covered. There are no refunds unless the event is cancelled by the committee. Vegetarian Options are available. Just book your tickets and pay via PayPal and then send an email to info@yorkshireoutdoorswimmers.com letting us know how many veggie options you require. If you are just coming for a swim and/or to participate in the races you can register that you are attending here but there is no need to pay. You will need a valid 2018 YOS membership but renewals and new signups can be done on the day. The normal £4 swim fee will apply as usual on the day for swimming in the normal session and/or the races, there is no additional charge to enter any of the races (they are all for fun). More details of the distances and types of races will be posted here soon as well as via social media channels. Any veggie options available or should I make something? Yes, there are vegetarian options. Its outside caterers serving the Pie and Peas so no need to bring anything, just come along and enjoy the afternoon. I’ve just added a note to the event page. You can book your tickets as normal and then just let us know by email how many veggie options you would like. Hi, can I just turn up an pay and swim at 2pm please? Yes, you can Martin as long as you are a current (2018) member? Otherwise, you would need to either join or renew for this year (which can be done on the day). Pie and Peas do need to be booked in advance though as we need numbers for catering. Hi my name is Richard I would like to come to swim on Saturday. I would like to join can I do this on the day? Can you tell me what fun events are on as I have read it’s your 4th year if the club. Hi Richard, Yes come along and join on the day. There are some short races happening as part of the Birthday event. Distances will depend on the conditions and will be announced on the day. We look forward to meeting you at the club.